The motivation behind the ornaments is even more special. FLORISSANT, Mo. — It’s a simple tree, artificial, with fake snow, adorned with red and blue ornaments. But the Christmas tree in the Florissant Police Department lobby is packed with a whole lot of meaning. 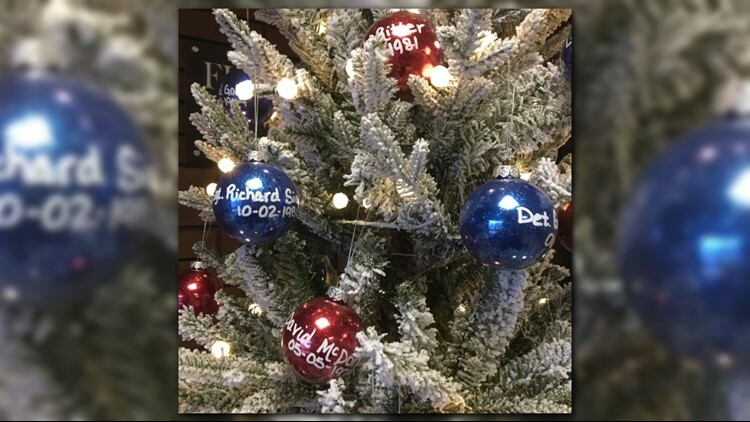 Each ornament bears the name of a police officer or firefighter killed in the line of duty. The tree twirls so visitors can fully take in each name, all 149 of them. "The date is the end-of-watch date. The day they passed," said Cindy Shaw. The motivation behind the ornaments is even more special. They were made by Shaw and her husband Jerry. Cindy’s father was shot in the line of duty. "This one belongs to my dad," Cindy said with a smile, carefully holding the blue ornament with her father's name. Jay Noser was an officer with the Florissant Police Department. In 1979, Sgt. Noser was shot eight times while trying to stop a bank robber. "I remember it vividly," she said. "I got the call from my step mom. She said he was shot, and I'm like okay. And I said, 'Where was he shot?' and she just broke down and couldn't talk and said, 'Everywhere,' and said you need to get here fast." He survived for nearly 30 years, but passed away in 2008 as a direct result of the gunshot wounds. "He loved being a police officer. It was his life," Cindy said. Noser's name is on the wall at the Florissant Police Department and now on a Christmas tree as well. "This tree belongs here. That's where dad's from and a piece of him is always going to belong here."